Yesterday, the 12th of September 2007, Mr. Shino Abe decided to resign as the prime minister of Japan throwing not only the Liberal Democratic Party but also the entire Japanese nation in quandary. It has just been a year since Mr. Abe took the leadership of the country, but within this time he had faced embarrassing moments in the Diet due to pension scandals, sleaze within his party and gaffe by his cabinet ministers. This led to the crushing defeat of the LDP in the House of Councilors election in July 2007. Now the opposition Democratic Party of Japan enjoys a majority in the upper house making it difficult for Mr. Abe to get any bills passed. He took all this quite bravely. He refused to step down hoping that calls for his resignation would gradually abate and he would get a second chance to prove his mettle. Last month he went on a whirlwind tour of three Asian nations including India to regain his lost popularity, but it proved to be a swan's song. Upon his return to Japan he reshuffled his cabinet bringing in erstwhile party stalwarts to bolster the sagging image of both his government and the party. He vowed to put his job on the line in order to renew the Anti-terrorism Law, before its expiry on November 1, 2007, even if it meant kowtowing to Mr. Ichiro Ozawa and his DPJ party. DPJ leader Mr. Ozawa has been a diehard critic of the Anti-terrorism Law, which allows the Maritime SDF forces to refuel ships patrolling the Indian Ocean. However Mr. Ozawa cannot rescind on his promise to oppose the Anti-terrorism Law, as it was part of his election manifesto that made his party win the election. Presumably Mr. Abe wanted to strike a deal with Mr. Ozawa and therefore requested an informal meeting. Understandably Mr. Ozawa refused to conduct such a meeting. Unable to break the cul-de-sac Mr. Abe resigned hoping that a new leader with greater political acumen would be able to do what he has failed to do. Now the immediate issue before the LDP is to quickly elect a new president and not allow the political vacuum to discredit the party further. 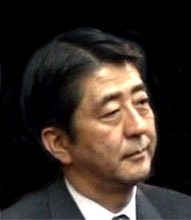 It is speculated that Mr. Abe's successor would be chosen by the 19th of this month from amongst the five contenders namely, LDP General Secretary Taro Aso, former prime minister Junichiro Koizumi, former finance minister Sadakazu Tanigaki, former chief cabinet secretary Yasuo Fukuda and Chief cabinet secretary Kaoru Yosano. The result will be announced on the 25th of September. It is most likely that Mr. Taro Aso might win his party's mandate, but recently we have had so many surprises in Japanese politics that it would be injudicious to make any conjecture. We must wait and see. Last two months have been both bewildering and stressful for Mr. Abe. During this time he did his best, but suddenly he lost his political will to fight. It came as a big surprise to the opposition and the public at large to hear of Mr. Abe's decision to resign after he had made a policy speech to implement national and international reforms. Mr. Abe felt that since he had failed 'to win public support and trust,' and could not 'aggressively promote' his policies, there was no other 'alternative' left for him but to resign. To add to his political woes, Mr. Abe has also not been keeping good health. Immediately after he announced his decision to step down he was hospitalized at Keio University Hospital at Shinanomachi, Tokyo for stomach and intestinal problems. Mr. Abe's unexpected decision to resign did not go well with the opposition party. Mr. Ozawa said, 'I've never known anything like it in all my 40 years as a politician.' Many people felt that Mr. Abe's decision to resign was rather irresponsible for it threw the already weakened LDP in disarray. If Mr. Abe thought that his resignation would break the LDP-DPJ impasse over the MSDF refueling in the Indian Ocean, he could have explored other viable alternatives. Though his party had fared badly at the hustings Mr. Abe was a reliable and capable man. He had boldly forged revisions to the Fundamental Law on Education and formulated the National Referendum Law to revise the Japanese constitution. His move to quit came as a great let down. The political reality for the new president would not be any different. The new president has to find ways to maneuver through the DPJ's majority in the upper house and their opposition to the renewal of the American-backed Anti-terrorism Law. If the new incumbent does not succeed in getting the Anti-terrorism Law renewed, the lower house may be dissolved leading to fresh countrywide elections. If this happens, once again a new political uncertainty would emerge.